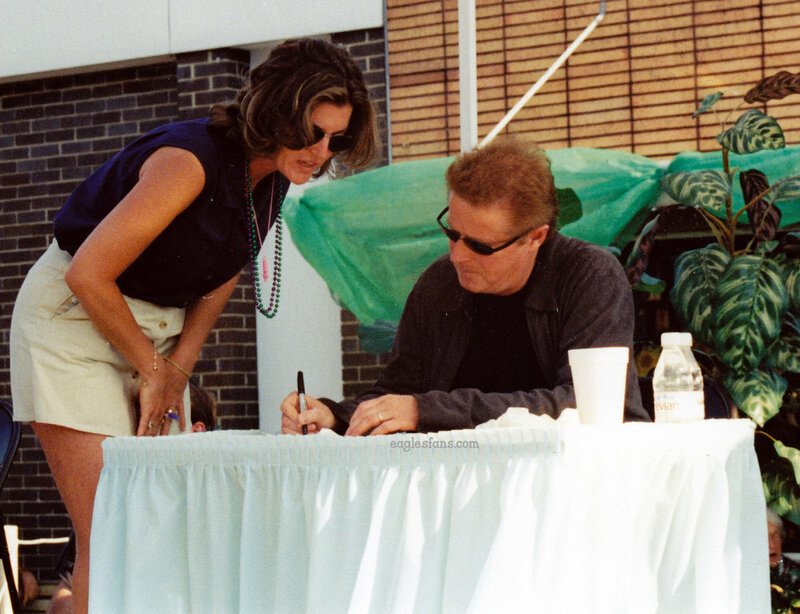 At the end of April, 2001, Don Henley returned to his hometown of Linden, TX to serve as the grand marshal of the Wildflower Trails Parade, an annual event in this East Texas town. Though we attended this event, for some reason, we never wrote about it for our newsletter, or even for the website. Maybe things were busy. I can't remember. We're going to attempt to write about it now, through the haze of about 16 years of memory. It really was a very cool and special day. We drove to Linden from Austin. It's about a 5 or 6 hour drive on county highways through towns that conjour up stereotypical visions of what small town Texas looks like. Becuase the main events were slated to begin in the morning, we went up the day before so that we could be ready to experience all that Linden had to offer. We (we did this trip with a friend) stayed the night in Marshall, a larger town near Linden and headed out in the morning to attend the parade. It was obvious right away how excited and proud the people of Linden were for this event and for the parade. The streets were already lined with people. After doing a little recognicance, we determined that the parade would come up one of the main streets into the town square (where the courthouse that Don helped restore is). The parade would then loop around the square. We thought we would stake out places on the street before the parade hit the square, take some photos and then head to the square to catch everything a second time. We ended up in front a car dealership where some friendly locals told us Don and his early bands played some of their first gigs. The parade would be familiar to anyone in any small town. It was awesome. Marching bands, baton twirlers, fire trucks, local civic organizations marched past us. Then it was the Henley float. It was made out to look like a fishing boat. 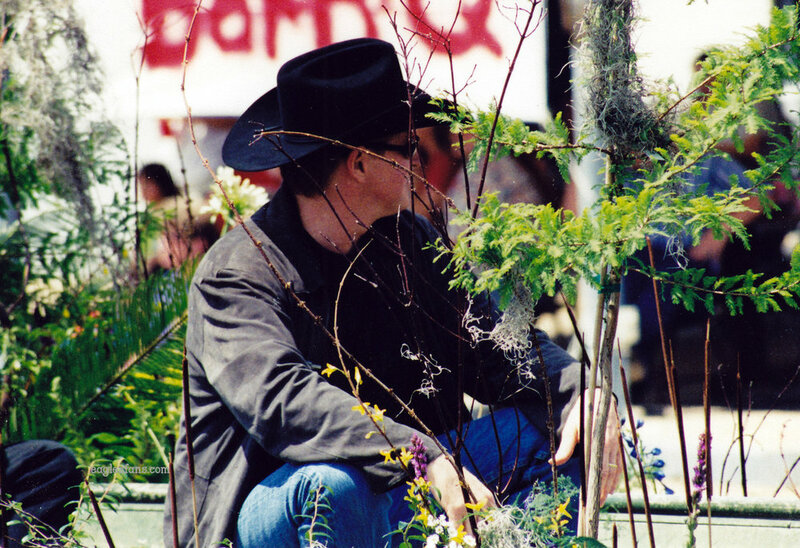 Don sat in the middle of wild flowers and plants wearing a black cowboy hat presumably to protect himself from the hot sun (more on that later). 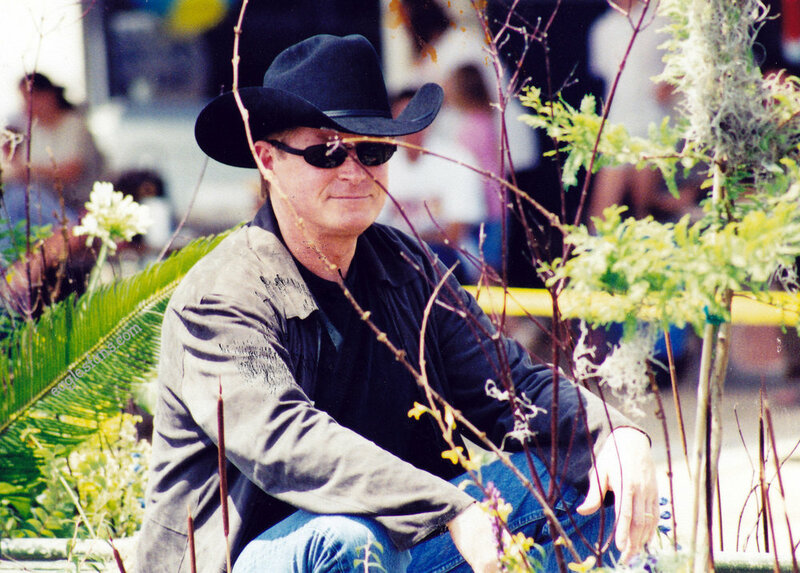 His friend Richard Bowden sat behind him on the float. The crowd cheered and Don smiled and waved. After doing some waving of our own, we sped down the street to find a place on the square. We ended up directly across from where the town dignitaries and guest of honor would be seated. Don's float did it's lap around the square while an announcer told everyone who he was (as if he needed to). Don stood and waved very humbly. Then the float kind of parked and Don got out and climbed up on the viewing platform as the rest of the parade parading (I guess that's what they do) past him so he could inspect it in his capacity of grand marshal. 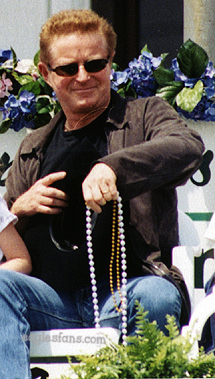 Don was joined on the stage by his family (wife, mother and kids). It was very cute how Don's kids fidgeted and squirmed just like any other little kids would. Don's wife busied herself taking photos. There was a bit of ceremony. The national anthem was sung and some performing groups did special routines (the only one I remember is that young girl did a cheer/dance routine to "All She Wants to Do is Dance". Don watched attentively and seemed very touched by everything going on. At the end of the parade, people placed Don's kids on horses to get them safely away. It was very cute. Then, we got a super surprise. It was announced that Don would sign autographs. This had not been previously announced , but we did have a few items on us "just in case"
Don took up residence under a tent. It was pretty hot and the sun was beating directly down on us. A line formed for people who wanted to speak with Don and get things signed. Don was incredibly gracious. He signed people's t-shirts, posed with people in bear costumes (?) and talked with each person. Did I mention before that it was hot? Did I talk about the sun? We didn't know we'd be standing so long in the sun and hadn't applied the proper amount of sunscreen. While waiting for our turn with Don (and it did take a while) we were getting some of the worst sunburn we've ever had in our lives. Finally, it was our turn. Don recognized us and greeted us warmly. He did that thing he always does and started with a random question. "Did you drive? How long did it take you?" From some things we learned since, we think that Don was under the impression that we still lived in the Rio Grande Valley, rather than in Austin. Had we still lived in the Valley, it would have been about a 10 hour drive, so maybe he was astonished that we had roadtripped that far. We talked about the drive and the day and presented him with what we had to sign (a copy of Texas Monthly and a local paper feature on the weekend). We had heard him admonish the guy who went before us who had him sign some concert photos that he better not see them for sale. That's why we were a bit taken aback when Don looked at us and said, "You can sell these." Lisa looked him in total astonishment so he added, helpfully, "you know...to recoup your expenses." By the way, we haven't sold these items. We said goodbye to Don and headed back to Marshall where we stopped at a drug store to get some Noxema for the horrendous sunburn. To accentuate the fact that we were in small town, Texas, we discovered that we couldn't order a beer at the Mexican restaurant we had dinner at because it was a dry county. In order to get a beer, you had to join a local social club for a nominal fee. What an amazing, amazing day! We heard later that Don attended the rodeo that night. We hadn't heard about that, so we missed out, but that was okay. Seeing Linden, welcome and honor one of its own was truly a remarkable experience. These are photos we took during the event as well as some stills form the videos that appear below. 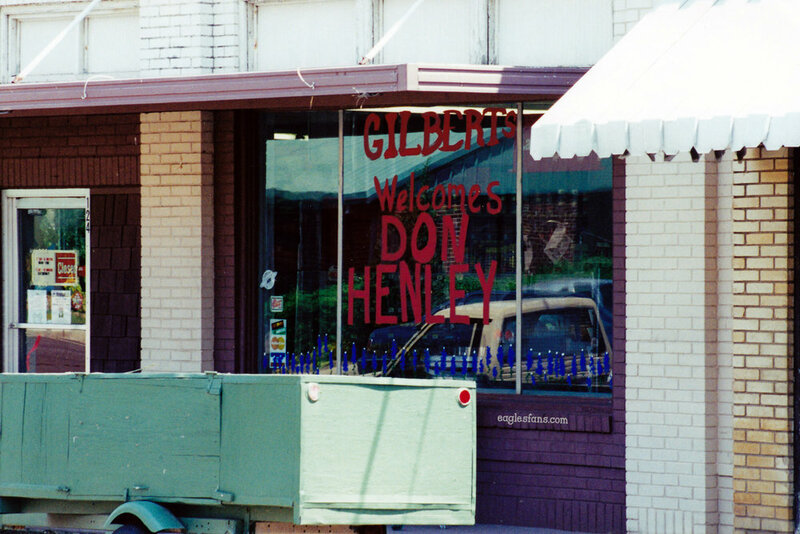 To commemorate the event, the town of Linden did some interviews with Don. We've got a few clips of that and then some shakey video from the parade.